The night swept up like a dark velvet wind in our faces, and we were still on the rocks. It came on more abruptly than we’d anticipated, and it was worse than we imagined. The wind moaned around the exposed point of the island. The sea thrashed the rocks with what seemed like fury when seen from so close. The night was darker than bitumen. I concentrated my entire energy on locomotion. My mind ranged ahead, seeking a route by crouching low and gazing peripherally at silhouettes against the sky. I tried to anticipate possible dead ends, and hidden disasters lurking unseen in the dark. It was too much work to have to turn back and retrace our steps. We stopped sometimes to regroup, huddling close together in the darkness, substituting contact for the faces whose expressions we couldn’t see. We buoyed ourselves up with jokes and false optimism, and we took comfort in the sham of a plan to reframe our increasingly desperate situation in terms of probable success. And then we kept going. I’d been scouting the route and had gotten absorbed in my task. I waited for them to catch up. 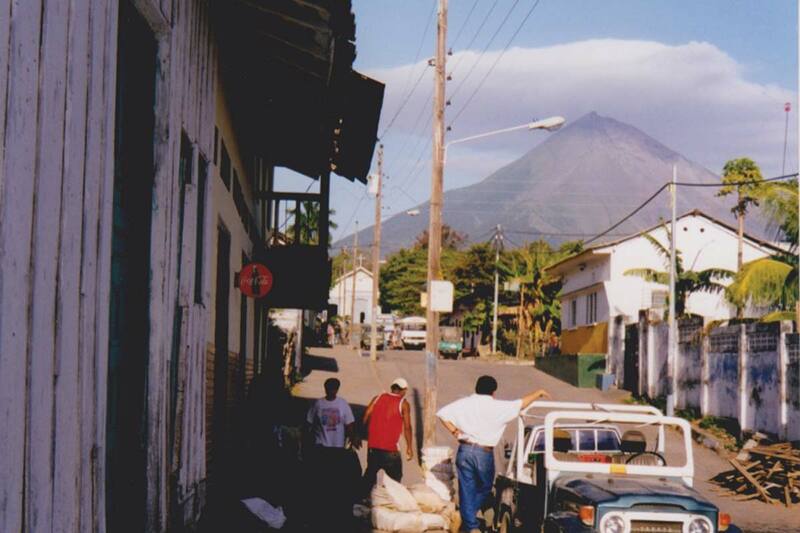 A volcano’s puff of smoke on Ometepe Island, Nicaragua. I reached up and held her leg, guiding her to the footholds I’d used. Her skin was slick with sweat, and covered in fine grit. “It’s okay, I’ve got you.” I reached up and held her weight. “There’s a flat spot down here.” She took a breath and eased herself down slowly. When she was safely beside me I reached up and helped Maya. It was the ultimate trust exercise: guiding each other’s sweaty limbs to invisible safety in the sharp black bottomless night. “I’m so tired,” Maya said, crouching down. 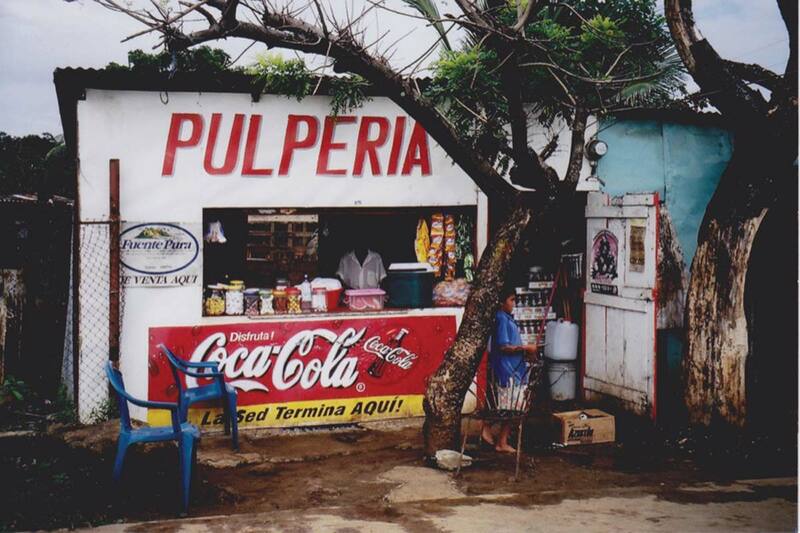 Shopping on Corn Island, Nicaragua. “Don’t worry, we’ll look after you.” I said it with a confidence I didn’t really feel. “I’m so glad you’re here,” Martina said, reaching out to squeeze my shoulder. Maya did the same. I remained silent, trying to comfort them with the illusion that I knew what we were doing. The jagged volcanic boulders were black to match the blackness of the night. There were no lights save the stars on this farthest corner of the island; no signs of human habitation. The surfaces varied wildly: there were abrupt drops in the abrasive rock, and sudden steep faces to lower ourselves over with blindly probing feet and the hope of touching bottom. That black-on-black world sucked us down into a growing feeling of disconnection, of unreality. 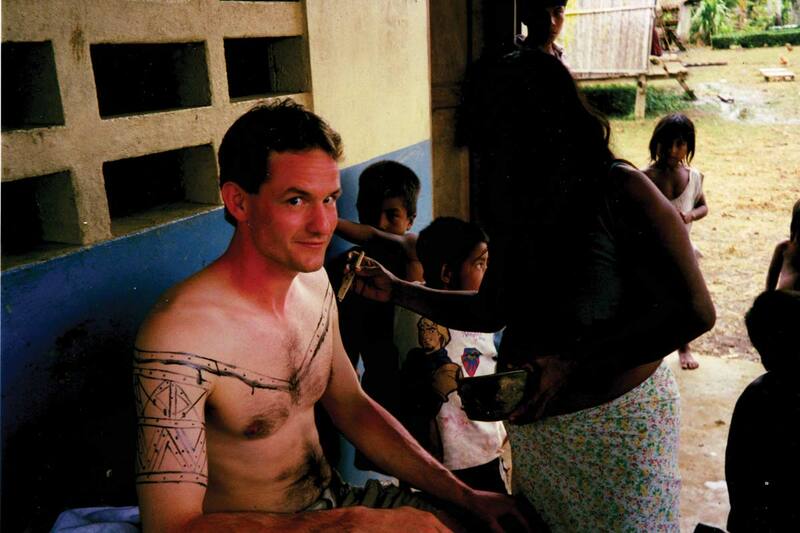 Getting tattooed with jagua in El Colo.
“Do we go on or turn back?” Martina finally said. It was the question we’d each been struggling with. “I say go on.” I couldn’t imagine retracing the treacherous, painstaking steps we’d already made. At least in the unknown ground ahead there was hope. The very fact that we continued on, the unwavering strictness of our efforts, seemed to render meaning. To give up that forward motion was to give up that same purpose and meaning. After that, what would we be left with? Almost unbelievably, our ordeal went on and on. From time to time our hopes were raised by a bend that promised the possibility of a new view. At every one of those curves I expected it to end, but I always saw more rocks jutting up as blank spaces against the starry night sky. Hope bled away through the scrapes and gouges in our palms. No one voiced their doubts, but part of me was growing resigned to a sleepless wait for daylight. 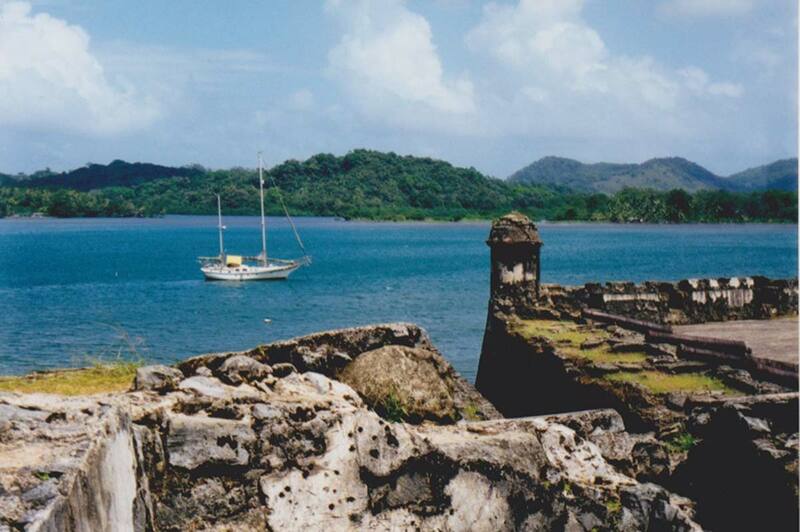 Sailing along Nicaragua’s Mosquito Coast. We inched along by touch, crawling spider-like and blind, in swimsuits and sandals that were completely unsuited to the task we faced. There was nothing else to do. We were together, but each was alone in a personal hell of inky blindness. The world shrank to my ragged breath and torn hands, to that feeling of straining forward with every sense. The pounding of the surf filled my head and caused a disconnected unreality, like the feeling of a parasite caught in the throbbing tide of the blood’s Brownian motion. There was no beginning and no end; it was always like this. Once I spied faint hope at a point where the hillside dipped down in what must have been a landslide or a cut off. I waited for the others to catch up. We squatted to silhouette the cliff against the sky. I scrambled up the loose dirt slope, conquering angle with momentum. Near the top I slid back and dislodged a shower of earth and pebbles, but I grabbed a tuft of grass by reflex and pulled myself over the edge. My heart thudded with the exertion, and with the adrenal dump of my near miss. There was barely room to stand. I was pushed up against a tangled wall of trees and matted vines that were a darker blackness than the night which engulfed us. Ropey spider webs clung to my face. Something slithered in the undergrowth. The forest exhaled a warm rotting smell of vegetation like fetid breath, which mixed with the tidal smell of sea animals at my back. As the night dragged on we lost all time sense. We became weighed down by a vague feeling of gloom and unreality. We seemed to have been parted from the everyday world—the world of light—for centuries. 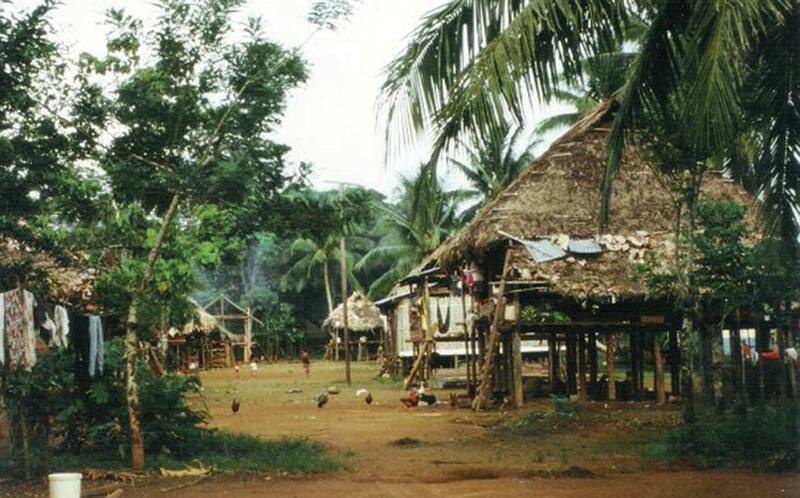 Somewhere quite near, beyond the hill and the crowning jungle, was the real world where old men listened to crackling radios on porches under the stars, where banana trees grew in back yards, where people worried over the small problems of their lives. Somewhere out there Zack and the Swedes were waiting for us. But we were gone. We were gone. We nearly lost our hold on that world of light in our strange disconnected limbo. To our other side lay miles of empty ocean darkness, and beyond that the even darker jungles of the Mosquito Coast. We were tiny dots in a vast wilderness, in country no longer watched even by a god. We clung to the fringes, and we fought our way back towards the world and life. Ryan Murdock is a longtime editor-at-large (Europe) for Outpost Travel Media. You can buy Vagabond Dreams on Amazon.